« Facing the Fear Addiction: Why Most of Your Fears Are Not Real. How to Deal With Disappointed Expectations. Today we ask that you let go of your attachment to things happening in a certain way. The only certain thing in your reality is that nothing is certain. It is funny, how even the smartest people continuously fail to learn this simple lesson, no matter how many times it is demonstrated. Like little children screaming when they drop their ice cream cone on the ground, the most intelligent men and women scream and thrash when they do not get what they want. And yet if you look back on the course of your life, you will see many examples of things not working out that were actually for the best. It might be a relationship that didn’t work out, that was very devastating at the time. Later on, you met a better match. Maybe it was a school you didn’t get into, or a job you didn’t get. Now, when you look back, you can see it was for the best. But oh how you suffered when it was happening. It is the same right now. You may be suffering terribly right now because you believe something you deserve is being denied to you. You are screaming and thrashing — on the inside, even if you don’t show it. But once time passes, this will be like all the other things. Of course, you may be someone who holds on to your past traumas and disappointments, and never lets go. You may believe that you are always a victim of injustice, and that your whole life ought to have gone differently. If so, you are willfully choosing to suffer unnecessarily in this lifetime. This is a very sad thing. Let go. Let go. Your disappointments are the failed expectations of your small, frightened, grasping self; your ego. That is why it is like the child screaming over the dropped ice cream cone. “Life isn’t fair!” the child shrieks. 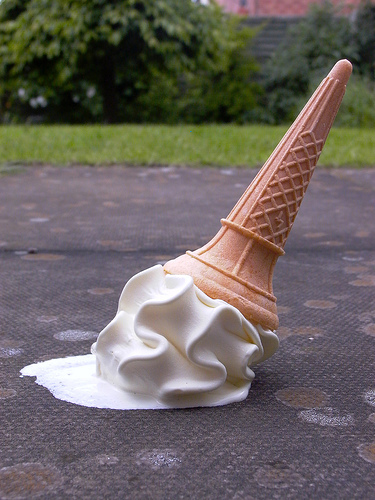 As you grow up, you hopefully learn that a fallen ice cream cone is not such a big deal. Maybe it is for the best that you don’t eat an ice cream cone at this moment. Move on. This is what it means to have faith. It means choosing to believe that reality is fundamentally good. That is not to minimize the severity of terribly difficult events in people’s lives. This is not to say that people aren’t traumatized. However, when trauma occurs, you have a choice: you can work to clear the trauma and regain your stability and faith; or you can stew in your sense of victimhood and injustice, and turn that into your identity. You all know individuals who endlessly wave the “victim” flag. It is a terribly unhappy way to live. It is like someone with a broken limb who, rather than wear a cast and allow healing to occur, instead chooses to let the limb remain broken and in constant pain in order to elicit the sympathy of others, and feel special. It’s hard to let go. I don’t know what it feels like to let go, so I find it difficult to imagine and attract. I guess the word “lightness” comes to mind. I’m gonna try to stop seeing myself as a victim, and as a lucky, lucky person! I think almost everyone is like this in one way or another. But just seeing what you do in your own work, Rachel, I certainly wouldn’t characterize you as someone caught in the victim identity. You’re definitely one of the ones who’d rather heal than stay stuck in it.